Abbey has been working at her great-grandmother's beauty parlor for three years, ever since her mom left her with Granny Po and took off. Abbey doesn't want to be like her mom, so she has a plan—she'll save every single penny she earns until she's a millionaire—before she turns thirty-five. 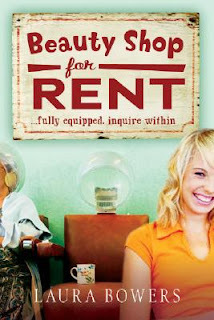 But when her Granny Po rents out her beauty shop to Gena, a young woman looking to start fresh, Abbey learns that having financial security doesn't protect you from life and getting hurt. Cover Comments: I like this cover a lot--it's pretty, it has character, and it is so colorful! Thanks for the review, I had seen this book before while browsing, but never stopped to really read what it was about. I agree, this book has a great cover! I'm going to see if I can get my hands on a copy one of these days, thanks for the recommendation.